Not to be confused with language change or code-switching. Proportion of languages used at home by residents aged 6 or over in Taiwan in 2010, sorted by birth year. 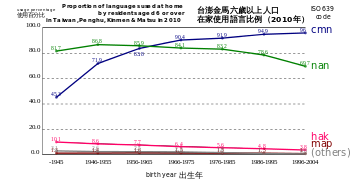 The chart shows that speech communities of Taiwanese local languages are shifting to speak Mandarin. Language shift, also known as language transfer or language replacement or language assimilation, is the process whereby a community of speakers of a language shifts to speaking a completely different language, usually over an extended period of time. Often, languages that are perceived to be higher status stabilise or spread at the expense of other languages that are perceived by their own speakers to be lower-status. An example is the shift from Gaulish to Latin that occurred in what is now France during the time of the Roman Empire. In the context of the Indo-European migrations, it has been noted that small groups can change a larger cultural area. Michael Witzel refers to Ehret's model[note 1] "which stresses the osmosis, or a "billiard ball," or Mallory's Kulturkugel, effect of cultural transmission." According to Ehret, ethnicity and language can shift with relative ease in small societies, due to the cultural, economic and military choices made by the local population in question. The group bringing new traits may initially be small, contributing features that can be fewer in number than those of the already local culture. The emerging combined group may then initiate a recurrent, expansionist process of ethnic and language shift. Language shift can be understood best as a social strategy through which individuals and groups compete for positions of prestige, power, and domestic security ... What is important, then, is not just dominance, but vertical social mobility and a linkage between language and access to positions of prestige and power ... A relatively small immigrant elite population can encourage widespread language shift among numerically dominant indigenes in a non-state or pre-state context if the elite employs a specific combination of encouragements and punishments. Ethnohistorical cases ... demonstrate that small elite groups have successfully imposed their languages in non-state situations. Halfway through the 20th century, the number of monolingual French-speakers began to predominate over the (mostly) bilingual Flemish inhabitants. Only since the 1960s, after the establishment of the Belgian language border and the socio-economic development of Flanders took full effect, could Dutch use stem the tide of increasing French use. French remains the city's predominant language while Dutch is spoken by a growing minority. At the current time, language shift is occurring all across China. Many languages of minority ethnic groups are declining, as well as the many regional varieties of Chinese. Generally the shift is in favour of Standard Chinese (Mandarin), but in the province of Guangdong the cultural influence of nearby Hong Kong has meant local dialects and languages are being abandoned for Cantonese instead and in cities such as Zhongshan, Shunde, Nanhai District, Panyu and Dongguan, younger native residents mostly communicate in Cantonese, instead of their mother-tongue. In Egypt, the Coptic language, a descendant of the Afro-Asiatic Egyptian language, was in decline in usage since the time of the Arab conquest in the 7th century. By the 17th century, it was eventually supplanted as a spoken language by Egyptian Arabic. Coptic is today mainly used by the Coptic Church as a liturgical language. In the Siwa Oasis, a local variety of Berber is also used alongside Arabic. Finland still has coastal Swedish-speaking enclaves, unlike Estonia where the last coastal Swedes were decimated or escaped to Sweden in 1944. As Finland was under Swedish rule from the medieval ages until 1809, the language of education was Swedish, with Finnish being allowed as a medium of education at the university only in the 19th century, and the first thesis in Finnish being published in 1858. Several of the coastal cities were multilingual; Viipuri had newspapers in Swedish, Finnish, Russian and German. However, the industrialization in the prewar and especially the postwar era and the "escape from the countryside" of the 1960s changed the demography of the major cities and led to the Finnish language dominating. While Helsinki was a predominantly Swedish-speaking city in 1910, the Swedish-speaking minority is now 6% of the population. According to Fañch Broudic, Breton has lost 80% of its speakers in 60 years. Other sources mention that 70% of Breton speakers are over 60. Furthermore, 60% of children received Breton from their parents in the 20s and only 6% in the 80s. Since the 1980s, monolingual speakers are no longer attested. Corsican was long employed as a conglomerate of local vernaculars in combination with Italian, the official language in Corsica until 1859; afterwards Italian was replaced by French, owing to the acquisition of the island by France from Genoa in 1768. Over the next two centuries, the use of French grew to the extent that, by the Liberation in 1945, all islanders had a working knowledge of French. The 20th century saw a wholesale language shift, with islanders changing their language practices to the extent that there were no monolingual Corsican speakers left by the 1960s. By 1995, an estimated 65 percent of islanders had some degree of proficiency in Corsican, and a small minority, perhaps 10 percent, used Corsican as a first language. In Southern Schleswig, an area that belonged to Denmark until the Second Schleswig War 1864, there was from the 17th and up to the 20th centuries a language shift from Danish and North Frisian dialects to Low German and later High German. Historically, most of the region was part of the Danish and North Frisian Language area, adjacent in the South to the German-speaking Holstein. But with the reformation in the 16th century German became church language and in the 19th century also school language in the southern parts of Schleswig. Added to this came the influence of German-speaking Holsatian nobility and merchants. German was (occasionally) also spoken at the royal court in Copenhagen. This political and economic development led gradually to a German language dominating in the southern parts of Schleswig. 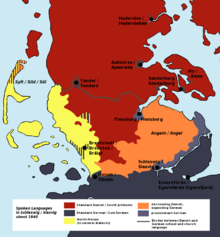 Native dialects such as the Angel Danish or Eiderstedt Frisian vanished. In the Flensburg area, there arose the mixed language Petuh combining Danish and German elements. So late as in 1851 (in the period of nationalization) the Danish government tried to stop the Language shift, but without success in the long run. After the Second Schleswig War the Prussians introduced a number of language policy measures in the other way to expand the use of (High) German as the language of administration, schooling and church service. Today, Danish and North Frisian are recognized as minority languages in the federal state of Schleswig-Holstein. In Hong Kong, Cantonese became the dominant language spoken in society since widespread immigration to Hong Kong began from the 1940s onward. With immigrants of differing mother tongues, communication was hard without a dominant language. With Cantonese originating from the capital of neighboring Canton province, Cantonese became the dominant language by extension, and other similar dialects started to vanish from use in Hong Kong. Original residents, or aboriginals, of Hong Kong used their own languages including the Tanka, Hakka and Waitau dialect, but with a majority of Hong Kong's population being immigrants by the 1940s and 50s, the dialects vanished at a rapid rate. Most of Hong Kong's younger generation does not understand, let alone speak, their ancestral dialects. Beginning in the late 1990s, since Hong Kong's return to Chinese sovereignty, Mandarin Chinese has been more widely implemented in education and many other areas of official society. Though adoption of Mandarin Chinese into society has been rapidly implemented, most Hong Kong residents would not regard it as a first language/dialect. Most Hong Kong residents prefer to communicate in Cantonese in everyday life. It is natural that Mandarin Chinese speakers and Cantonese speakers could not mutually understand each other without learning the languages, due to vast difference in pronunciation, intonation, sentence structure and terminology. Furthermore, cultural difference between Hong Kong and China brings upon the variations between the Cantonese used in Hong Kong and that in Canton Province. The Italian peninsula, the Po river basin and the nearby islands have been a conglomerate of different languages, Latin-derived for the most part. Italy was politically organized into several states up to the late 19th century. Since the Renaissance, a trans-Italian language employed for formal, literary and written purposes was developed based on Florentine Tuscan; having been adopted as the official language by the preunitarian states across the peninsula since the Middle Ages, literary Florentine established itself as the single most representative language of Italy long before its political unification in 1861, sidelining the others in education and formal settings. Most of the other languages, with the exception of the twelve historical linguistic minorities, long served as local vernaculars alongside Italian in a diglossic spectrum, and they have been incorrectly labelled as "dialects" by their own speakers. Italian further expanded as a commonly spoken linguistic form for everyday use throughout the country after World War II. Cimbrian, a Germanic language related to Bavarian, was spoken by at least 20,000 people in the 19th Century, with 3,762 people in 1921 and fewer than 300 in 2007. The same scenario goes for Mòcheno and Walser. Unlike the neighbouring island of Corsica (France) and elsewhere in today's Italy, where Italian was the standard language shared by the various local elites since the late Middle Ages, Italian was first officially introduced to Sardinia, to the detriment of both Spanish and Sardinian (a Southern Romance language), only in 1760 and 1764 by the then-ruling House of Savoy. Because of the promotion and enforcement of the Italian language and culture upon the Sardinian population since then, the majority of the locals switched over to such politically dominant language and no longer speak their native ones, which have seen steady decline in use. The language has been in fact severely compromised to the point that only 13℅ of the children are able to speak it, and today is mostly kept as a heritage language. With the exception of a few sparsely populated areas where Sardinian can still be heard for everyday purposes, the island's indigenous languages have by now been therefore largely absorbed into Italian; the language contact ultimately resulted in the emergence of a specific variety of Italian, slightly divergent from the standard one. On a survey made by Il Gazzettino, 70% of respondents told they spoke Venetian "very or quite often" in the family, while 68% with friends. A much lower percentage reported to use it at work (35%). The local dialect is less used in formal situations. The frequency of use within the family networks and friendship stops respectively at -4 and -11 percentage points, suggesting a slow shift to Italian, while the use in the workplace drops to -22 percentage points. A visible generational gap has also been noted, since the students and young people under the age of 25 are the social group where the use of dialect falls below the threshold of absolute majority (respectively 43 and 41%). However, despite some tendencies signalling the slow advancement of standard Italian, the local dialects of Veneto and the Province of Trieste are still widely spoken alongside Italian; like in much of Italy, the presence of Italian in Northeast Italy does not seem to take anything away from the region's linguistic heritage. Like the aforementioned case of Northeast Italy, even in Southern Italy the local dialects are still widely used in combination with standard Italian, depending upon the social context. More specifically, Italian as the prevalent language spoken among family members is spoken the least in Campania (20,7%), Calabria (25,3%) and Sicily (26,6%), contrary to frequency of use of the local dialects (Basilicata, 69,4%; Calabria 68,6%; Campania, 75,2%; Sicily, 68,8%). Before the 1930s, Italian was the only official language of Malta, although it was spoken by only the upper classes, with Maltese being spoken by the lower class. However, English was then added to the mix, and was made a co-official language alongside Maltese, with Italian being dropped as official. The English language has since grown in the country and now threatens the status of Maltese. The number of speakers of Italian there has increased from when Italian was official. A trend among the younger generations is to mix English and Italian vocabulary patterns, in making new Maltese words. For example, the Maltese word for library was originally "bibljoteka", but this has since been displaced by "librerija", formed from the English "library", and an Italian-pattern ending. In addition to mixing English with Italian, Maltenglish is a commonly occurring amalgam of English and Maltese. This involves using English words in Maltese sentences, or adding English vocabulary into Maltese. Trends show that English is becoming the language of choice for more and more people, and is transforming the Maltese language. In the Philippines, Spanish-speaking families have gradually switched over to English since the end of World War II until Spanish ceased to be a practical everyday language in the country. After Singapore's independence in 1965, there was a general language shift in the country's interracial lingua franca from Malay to English, as English was chosen as the first language for the country. Among the Chinese community in Singapore, there was a language shift from the various dialects of Chinese to English and Mandarin Chinese. Until the 1980s, Singaporean Hokkien was the lingua franca of Chinese community in Singapore, which has since been replaced with English and Mandarin today. There has been a general language attrition in the use of Chinese other than Mandarin Chinese, especially amongst the younger segments of the Singaporean population. The progressive dominion exerted by the Kingdom of Castile over Spain in as much as it gained political power throughout centuries, contributed to the expansion of its language at the expenses of the rest. The accession of the Castilian House of Trastamara to the Crown of Aragon by mid-15th century saw the gradual displacement of the royal languages of the Crown of Aragon, Aragonese and Catalan, despite the prolific Valencian literature in Catalan in this period. Nebrija's Gramatica castellana (1492), sponsored by the new Spanish monarch Ferdinand II of Aragon, was meant to help expand Castilian, "the companion of the Empire". As the Crown of Castile expanded, its different governmental officials at different levels required their subjects to use or understand Castilian and sideline other vulgar languages, or vernaculars. It often meant the use of interpreters in lawsuits, which could tilt the outcome of the case one side or the other, e.g. the Basque witch trials, and the increased use of Castilian in assemblies and decision-making bodies, and documents, despite not being the commonly understood language in a number of areas, like most of the Basque districts (Navarre, Álava, etc. ), Catalonia, Galicia, Asturias, parts of Aragon, etc. The Peninsular War was followed by the centralization of Spain (Constitutions of 1812, 1837, 1845, 1856, etc. ), with only the Basque districts keeping a separate status until 1876. Compulsory education in 1856 made the use of Castilian (Spanish) mandatory, as well as discouraging and forbidding the use of other languages on a number social and institutional settings. Franco and his nationalist dictatorship imposed Spanish as the only valid language for any formal social interaction (1937). By the early 21st century, Spanish was the overwhelmingly dominant language in Spain, with Basque, Catalan, and Galician surviving and developing in their respective regions with different levels of recognition since 1980. Other minorized languages (Asturian, Aragonese) have also seen some recognition in the early 21st century. Catalan, sharing with Basque a strong link between language and identity, enjoys a fairly sound status. Basque competence levels have picked up during the last decades, but everyday use does not go up accordingly. Asturian has been classified by the Endangered Languages Project as being at risk, and Aragonese as an endangered language. Taiwanese aborigines used only Austronesian languages before other ethnic groups conquered Taiwan. After widespread migration of Han peoples from the 17th to the 19th century, many Taiwanese Plains Aborigines became Sinicized, and shifted their language use to other Sinitic tongues, (mainly Taiwanese Hokkien). Additionally, some Hakka people (a Han Chinese ethnic subgroup) also shifted from Hakka Chinese to Hokkien (also called Hoklo). This happened especially in Yongjing, Changhua, Xiluo, Yunlin, etc. They are called Hoklo-Hakka (Pha̍k-fa-sṳ: Ho̍k-ló-hak, Pe̍h-oē-jī: Ho̍k-ló-kheh, Hanzi: 福佬客). When Taiwan was under Japanese rule, Japanese became the official language, with the Japanese government promoting Japanese language education. It also led to the creation of Yilan Creole Japanese, a mixture of Japanese, Atayal language, and Hokkien  in Yilan County. In World War II, under the Japanification Movement, Chinese was banned in newspapers and school lectures, and the usage of Japanese at home was encouraged, so many urban people turned to using Japanese. In 1941, 57% of Taiwanese could speak Japanese. After the ROC government established rule over Taiwan in 1945, it prohibited use of Japanese in newspapers and schools, and promoted the Guoyu movement (Chinese: 國語運動) to popularize Standard Mandarin, often through coercive means. In the primary education system, people using local languages would be fined or forced to put on a dialect card. In the mass media, local languages were also discouraged or prohibited, and some books on the romanization of local languages (e.g. Bibles, lyrics books, Pe̍h-ōe-jī) were banned. In 1975, The Radio and Television Act (Chinese: 廣播電視法) was adopted, restricting the usage of local languages on the radio or TV. In 1985, after the draft of the Language and Script Law (Chinese: 語文法) was released by the Ministry of Education, it received considerable opposition because it banned the use of Taiwanese unofficial languages in the public domain. In response, some Hakka groups demonstrated to save their language. After 1987 when martial law was lifted, the Guoyu movement ceased. Nevertheless, Taiwanese Mandarin has become the most common language in Taiwan today, and the most common home language of Taiwanese youth. In the population census of 2010, Mandarin is the most common home language in the Taipei metropolitan area, Taoyuan, Matsu, aboriginal areas, some Hakka-majority areas, as well as some urban areas of Taichung and Kaohsiung. Conversely, the ability of Taiwanese to speak ethnic languages is strikingly on the decline. Gaelic has long suffered from its lack of use in educational and administrative contexts and was long suppressed. The shift from Gaelic to Scots and Scottish English has been ongoing since about 1200 CE; Gaelic has gone from being the dominant language in almost all areas of modern-day Scotland to an endangered language spoken by only about 1% of the population. With the advent of devolution, however, Scottish Gaelic has begun to receive greater attention, and it has achieved a degree of official recognition when the Gaelic Language (Scotland) Act was enacted by the Scottish Parliament on 21 April 2005. Gaelic medium education in Scotland now enrolls over 2000 pupils a year. Nevertheless, the number of native speakers continues to decline and it is a minority language in most of the traditional Gàidhealtachd, including all census areas outside of the Outer Hebrides. Although English has been the majority language in the United States since independence in 1776, other languages were spoken first in large areas of the country. In addition to hundreds of aboriginal languages, French was once the primary language in Louisiana, Missouri, and areas along the border with Quebec, but the speaking has diminished due to new waves of migration and the rise of English as a lingua franca. Californio Spanish rapidly became a minority language during the mass immigration that took place during the California Gold Rush, and has largely been supplanted by English and Mexican Spanish, surviving mainly as a prestige dialect in Northern and Central California. German was once the primary language in large areas of the Great Plains and Pennsylvania, but was suppressed due to anti-German sentiment during the First World War. ^ Michael Witzel: Ehret, Ch., 1988. "Language Change and the Material Correlates of Language and Ethnic Shift," Antiquity, 62: 564–74; derived from Africa, cf. Diakonoff 1985. ^ Compare the process of Sanskritization in India. ^ Another example Anthony gives of how an open social system can encourage recruitment and language shift, are the Pathans in western Afghanistan. Traditionally status depended on agricultural surpluses and landownership. The neighbouring Baluch, outnumbered by the Pathans, were pastoral herders, and has hierarchical political system. Pathans who lost their land, could take refuge among the Baluch. As Anthony notes, "chronic tribal warfare might generally favor pastoralism over sedentary economics as herds can be defended by moving them, whereas agricultural fields are an immobile target." ^ Sources: 2010 population and housing census by DGBAS, Executive Yuan. ^ Jones, Martin (2004). Traces of Ancestry. Cambridge. ^ Forster P, Renfrew C (2011). "Mother tongue and Y chromosomes". Science. 333 (6048): 1390–1391. doi:10.1126/science.1205331. PMID 21903800. ^ a b c d Witzel 2005, p. 347. ^ Anthony 2007, p. 117-118. ^ a b Anthony 2007, p. 118. ^ Anthony 2007, p. 118-119. ^ Thomas M. Barker, The Slovene Minority of Carinthia (New York: Columbia University Press, 1984). ^ Matjaž Klemenčič and Vladimir Klemenčič, The Endeavors of Carinthian Slovenes for their Ethnic Survival with/against Austrian Governments after World War II (Klagenfurt-Ljubljana-Vienna: Mohorjeva založba/Hermagoras Verlag, 2008). ^ "Université Laval: Accueil". ulaval.ca. Archived from the original on 2009-06-19. ^ "Thuis in gescheiden werelden — De migratoire en sociale aspecten van verfransing te Brussel in het midden van de 19e eeuw - BTNG-RBHC, XXI, 1990, 3-4, pp. 383-412, Machteld de Metsenaere, Eerst aanwezend assistent en docent Vrije Universiteit Brussel" (PDF). biobrussel.be (in Dutch). ^ "Protesters Stand Firm on Cantonese Rights". TIME. 2 August 2010. Retrieved 3 April 2012. ^ Estella S. Poloni; Yamama Naciri; Rute Bucho; Régine Niba; Barbara Kervaire; Laurent Excoffier; André Langaney; Alicia Sanchez-Mazas (November 2009). "Genetic Evidence for Complexity in Ethnic Differentiation and History in East Africa". Annals of Human Genetics. 73 (6): 582–600. doi:10.1111/j.1469-1809.2009.00541.x. PMID 19706029. ^ Veltman & Denis (1989) Le declin du dialecte alsacien. ^ a b c d "Dutch/Flemish in the north of France" (PDF). , by Hugo Ryckeboer. University of Ghent. ^ Raynaudon-Kerzerho, Maiwenn. "Fañch Broudic : "Le breton a perdu 80 % de locuteurs en 60 ans."". Retrieved 1 November 2015. ^ Hutchinson, Wesley; Ní Ríordáin, Clíona (2010). Language issues: Ireland, France and Spain. Peter Lang. p. 176. ISBN 9789052016498. ^ "Le Sénat dit non à la Charte européenne des langues régionales". franceinfo. Retrieved 1 November 2015. ^ "Corsican in France". Euromosaic. Retrieved 2008-06-13. To access the data, click on List by languages, Corsican, Corsican in France, then scroll to Geographical and language background. ^ Hawkey, James; Langer, Nils (2016). Language Policy in the Long Nineteenth Century, Catalonia and Schleswig. ^ Coluzzi, Paolo (2007). Minority Language Planning and Micronationalism in Italy. Peter Lang. p. 224. ^ "La limba proibita nella Sardegna del '700 da Ritorneremo, una storia tramandata oralmente". Retrieved 28 November 2015. ^ Porcellato, Natascia. "A Nordest il dialetto resiste ma si parla più in famiglia che al lavoro". Retrieved 1 November 2015. ^ a b Ang Ui-jin. "台灣的語言政策何去何從". ^ Yardumian, Aram; Schurr, Theodore G. (2011). "Who Are the Anatolian Turks?". Anthropology & Archeology of Eurasia. 50: 6–42. doi:10.2753/AAE1061-1959500101. Archived from the original on 29 October 2013. Retrieved 21 October 2013. These data further solidify our case for a paternal G/J substratum in Anatolian populations, and for continuity between the Paleolithic/Neolithic and the current populations of Anatolia. ^ "'Jafaican' is wiping out inner-city English accents". Mail Online. Retrieved 2016-11-07. ^ "BBC show reveals cockneys are 'endangered species' in London borough". Mail Online. Retrieved 2016-11-07. ^ "Cockney to disappear from London 'within 30 years'". BBC News. 2010-07-01. Retrieved 2016-11-07. ^ "Research shows that Cockney will disappear from London's streets within a generation". Lancaster University News. Retrieved 2016-11-07. ^ "The Survival of French Language in Vietnam". JAPAN and the WORLD. 2015-11-01. Retrieved 2017-08-21.